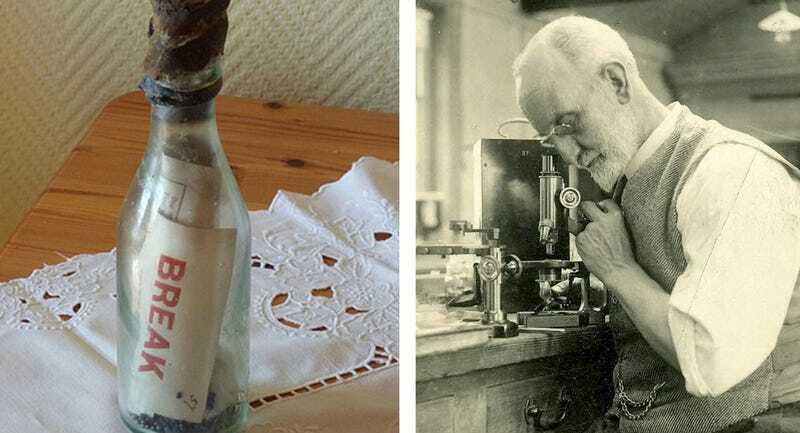 Back in April, a retired postal worker named Marianne Winkler discovered a message in a bottle that had washed up on a German beach—and her find may be the oldest message in a bottle ever recovered. Between 1904 and 1906, George Parker Bidder, a researcher for the UK Marine Biological Association (pictured above) tossed about a thousand bottles into the North Sea. Bidder was studying ocean currents and each bottle contained a note inside promising a small reward (one shilling) for anyone who mailed it back. The note included a survey in English, German and Dutch that would help researchers learn when and where the bottle was found. When Winkler and her husband found the bottle this past spring, they followed the century-old instructions inside and mailed the survey and bottle to the Marine Biological Association. Needless to say, researchers at the organization were shocked. “It was quite a stir when we opened that envelope, as you can imagine,” Guy Baker, from the Marine Biological Association told The Telegraph. A number of incredibly old bottles with messages have been found in the past couple years. Back in 2013, a beachcomber in British Columbia, Canada found a message in a bottle from 1906—107 years old. And just last year, fishermen off the coast of Germany found a message in a bottle from 1913—101 years old. “We think this bottle was one of the last batch he sent out, in 1906, so that would make it 108 years old,” Baker told the Telegraph. That would make it the oldest ever, but there’s no way to tell for certain. They’ll still be submitting it to the Guinness Book of World Records, which currently holds that the “official” oldest was found after 99 years. Whether it’s the oldest message in a bottle or not, at least the Winklers got their shilling, as you can see in the photo above.